This week’s challenge, third Monday, is Black and White. I present you a picture that I took several weeks ago when I went out for jogging about 15 km around my home. I usually bring either my iPhone or my S4 to take pictures during my jogging and track my exercise using Endomondo. There was a boy who was sleeping under a tree when his parents were selling meats and vegetables using a car not far from him. If I were his parents, I would never put him far from my attention. Just imagine if there was animals like wild dog biting him or fire ants or even worse, somebody kidnap him. The photo was taken using S4 and edited with Fotor for Android for the Black and White and Tilt Effect. I’m completely drawn into the image: the child in focus and the background blurring part of the story. The monochrome emphasizes the possibilities that are stated in your text. Well done. Happy Phoneoography Monday. Thank you Sally! Luv joining this challenge! Can’t wait for the next Monday! That’s terrific–very much enjoy having you participate. 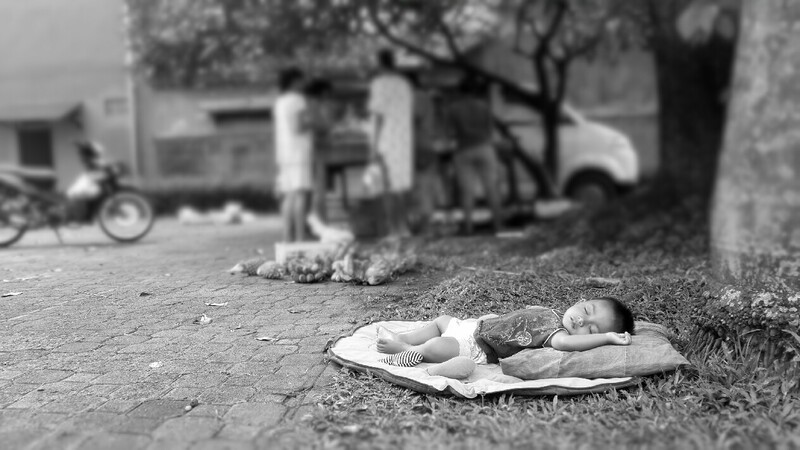 Of course you gain points just for the cuteness of the photo, but making the background blurred really focuses the viewer on the sleeping boy. Lovely! Thank you Dear Janet for your lovely comment! Ping-balik: (i)Phoneography Challenge: Monday Black and White | What's (in) the picture?